A quick look back at past Anime Festival Asia (AFA). 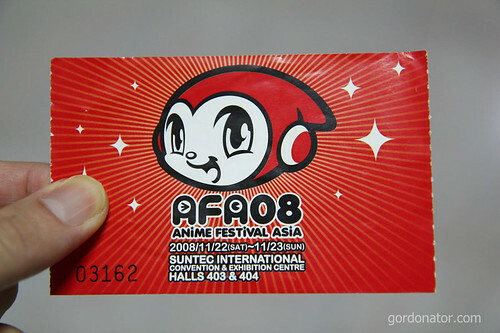 In 2008, the first ever AFA was staged at Suntec City Convention Halls, the same venue till today and hopefully for the future as well. Back then, the convention hall was much smaller, lesser booths and lesser showcase. Some booths wasn’t even anime related as well. The stage was within the same convention hall together with the booths and was very small as well. The concert guests were Mizuki Ichirou and May’n. Mizuki Ichirou even commented he wish the stage can be bigger. He got his wish as the following years on, AFA just keeps on getting bigger and bigger. 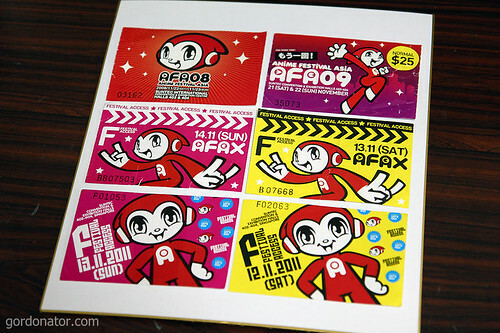 To date, 2011 is the 4th AFA in Singapore. Next year we will see the AFA brand travel to neighbouring countries in South East Asia. The above are the ticket counterfoil from 2008 and 2011. It’s my valuable collection, like a piece of memento that shows that I have been to the event. I didn’t know that AFA is actually that young. It’s nice to hear that the event is getting bigger and bigger along with the popularity by the year. I always hear a lot of hype about it, but still haven’t got the chance to. Hopefully I’ll get to do so in the near future! The wrist band is for those who purchased concert tickets as well. The tickets I have are bought on event day at the venue itself. gotta love the media tag, may I know how to become one for the AFA? 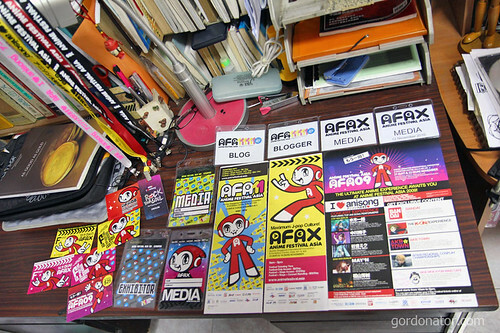 thanks to this post, I decided to hunt down my AFA tickets and brochures too!